Government – 200+ postcards a day can't be ignored. Just one of the thousands and thousands of postcard despatched to MPs – this one is to Education Minister Nikki Kaye – she can’t ignore the message, it’s coming through loud and clear. CTU president, Labour MP lend support. 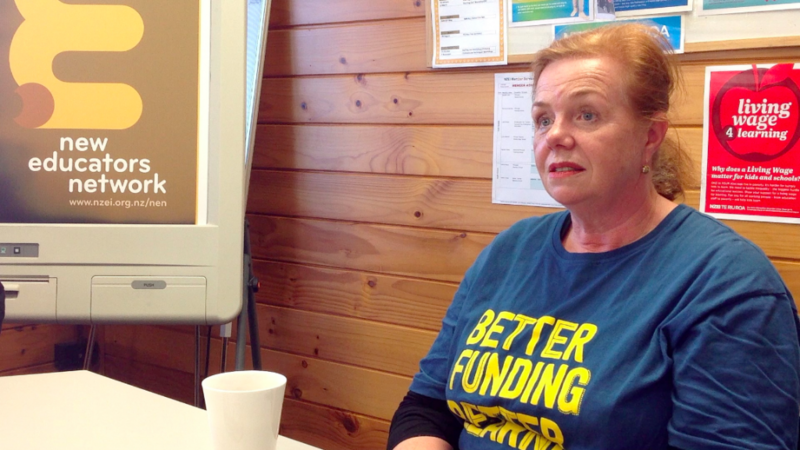 ​Thank you Richard Wagstaff and Kris Faafoi for showing your support for our Better Funding campaign! 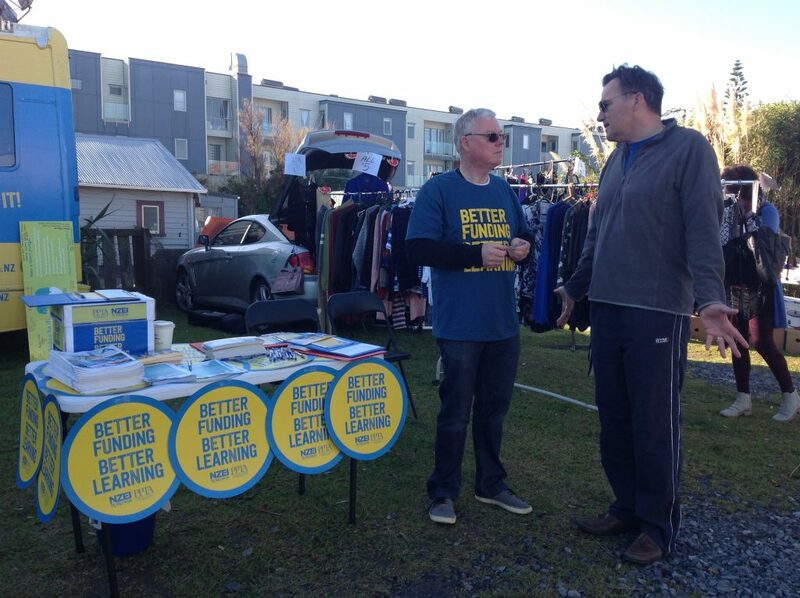 NZ Council of Trade Unions president Richard Wagstaff at Paraparaumu Beach market on Saturday morning, talking about the issues with NZEI Kapiti branch president Peter Corlett. 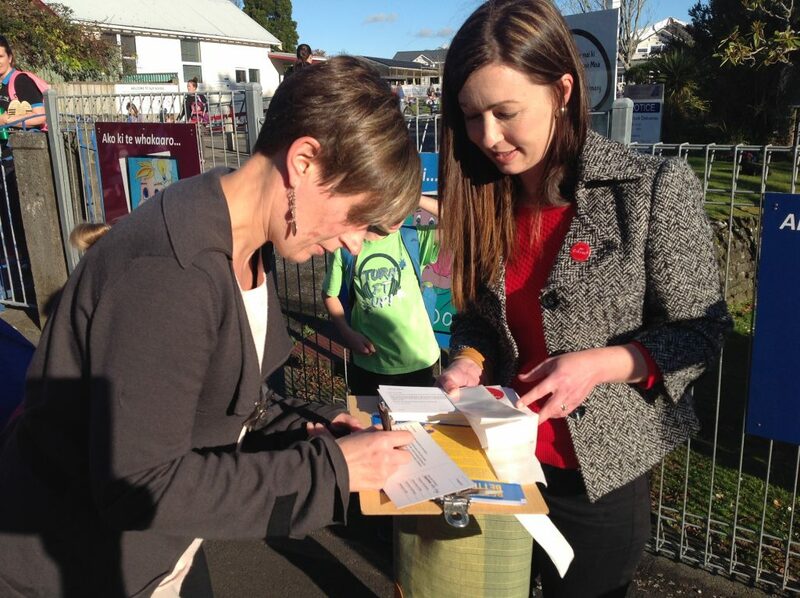 Labour MP Kris Faafoi was out with the team on Saturday asking the public to sign postcards in support of Better Funding, with principal at Russell School Sose Annandale (left) and Molly Daube a teacher at Raumati Beach School. Setting up the market stall in the dark on a Saturday morning – dedication! 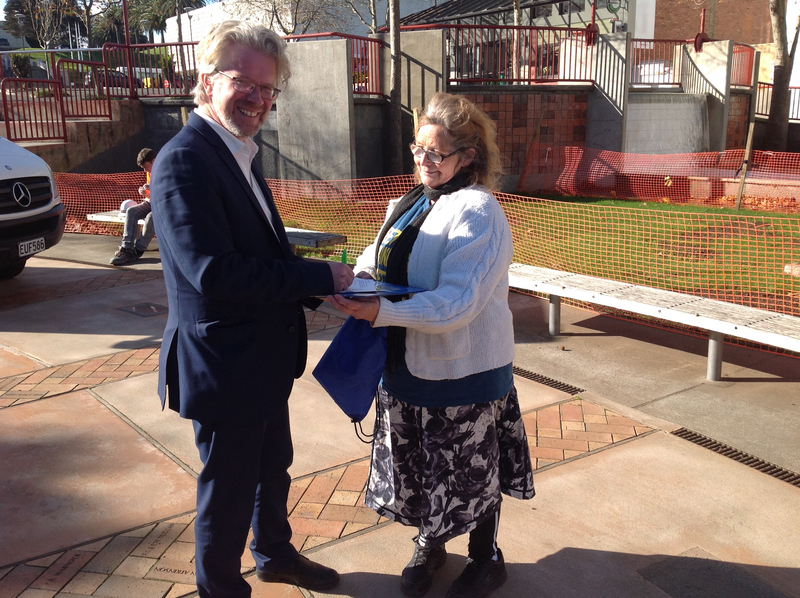 Whanganui Mayor Hamish McDouall signing a postcard for Rhonda Svendsen lunchtime at Majestic Square. Great to have the Mayor’s support! 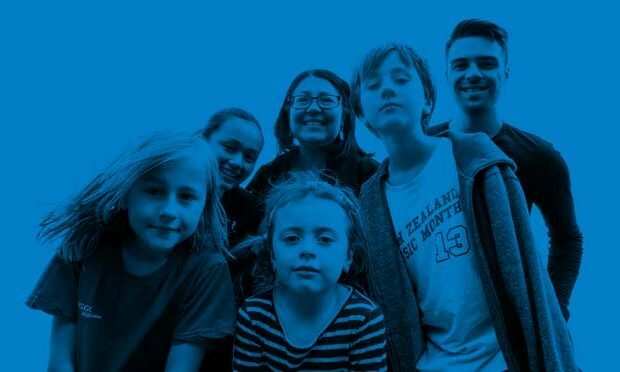 Hawera office reporter Jane Matthews from the South Taranaki Star and Taranaki Daily News came along to Ramanui School and talked to staff and activists when the camper van visited – well done, team, it counts every time we get the message out. Read here. Support staff are worth it. Listen to this amazing short video where support staff discuss the scope and requirements of their employment. They are often the experts on complex issues and needs, technology, health and safety, and relied on for their expertise by other staff. Where’s the professional development in their job description? They need to be compensated for the professionals that they are. Listen to Monique Jansonius-Albers (main speaker) as the camera moves left we have Lynice Anderson, Jenny Wansbrough and Calley Whale as the second speaker. 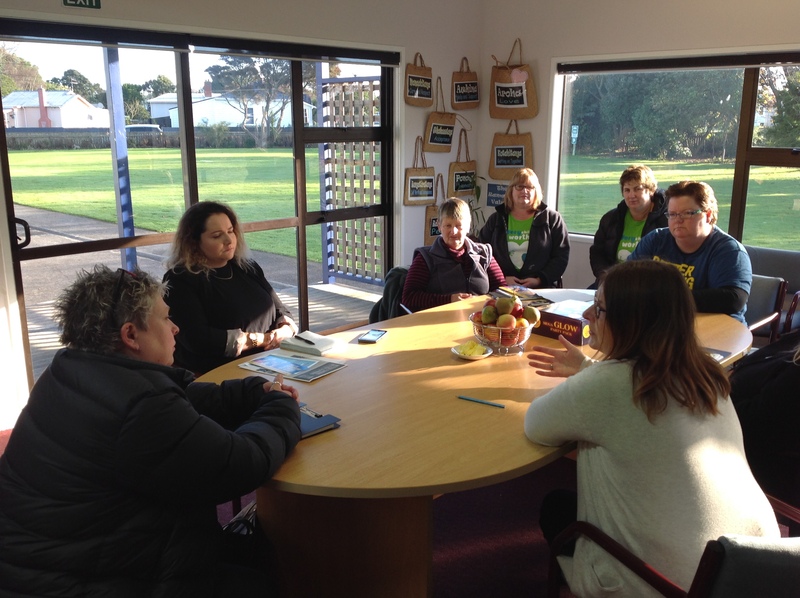 Monique and Calley have agreed to be the teacher aide representatives for pay parity from the Taranaki Area Council. Pay negotiations for support staff continue with the Ministry of Education, as school face making hard budget choices and cutting support staff hours. The Budget raised the ops grant by 1.3%, while our research shows that we need 4% to get us back to where we were and give support staff a 2% pay increase. 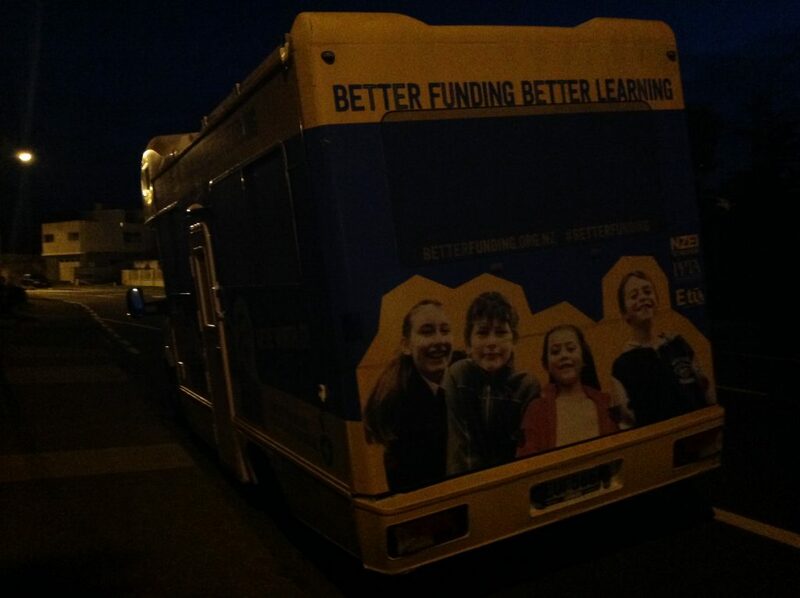 Three political candidates turned out in Taranaki to support the teachers and the Better Funding tour. 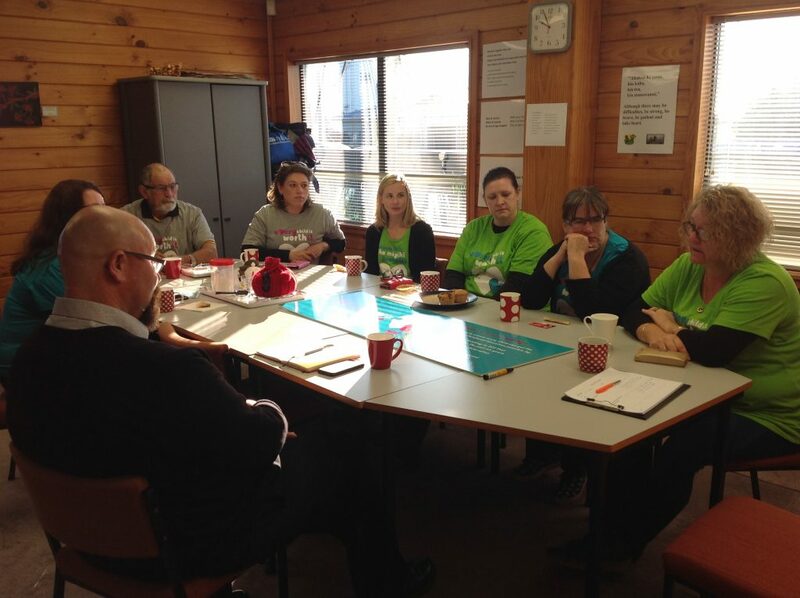 Labour’s Corie Haddock met with teachers and principals one day and support staff the next, hearing their concerns and he was clearly moved by what he heard from support staff. The Green Party’s Stuart Bramhall spent the day with the van, canvassing and signing up postcards. 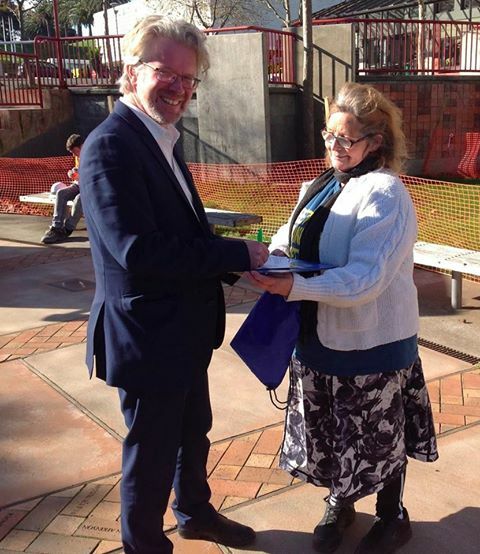 And Labour’s Hilary Humphrey was at Inglewood Kindergarten to meet parents and early childhood teachers. It’s great to see young people on board with the campaign. 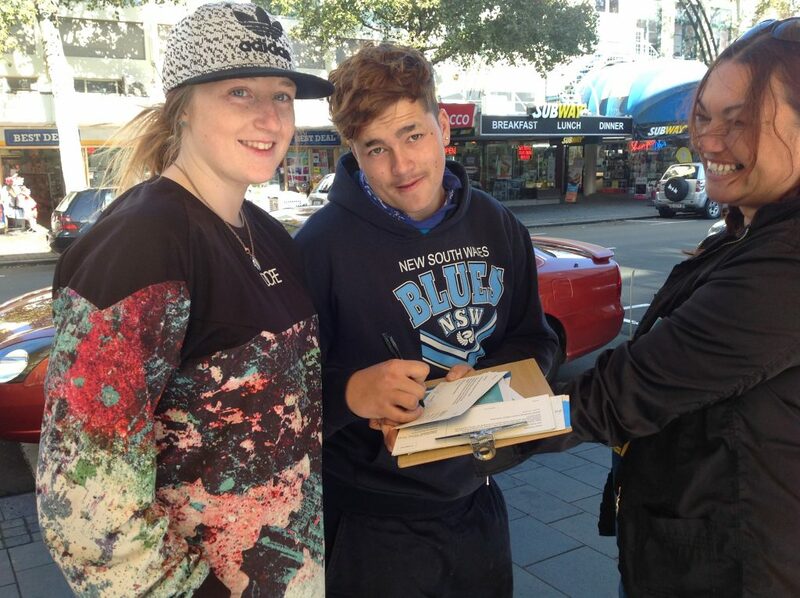 New Plymouth, June 7 at Huatoki Plaza, Marishka Arden Fisher (left) and Johannesburg Carmichael with NZEI’s Ngawai O’Carroll were happy to send a postcard requesting the Minister of Education put more funding in education. Our children are the future and we need to ensure that we resource education adequately now for future investment. 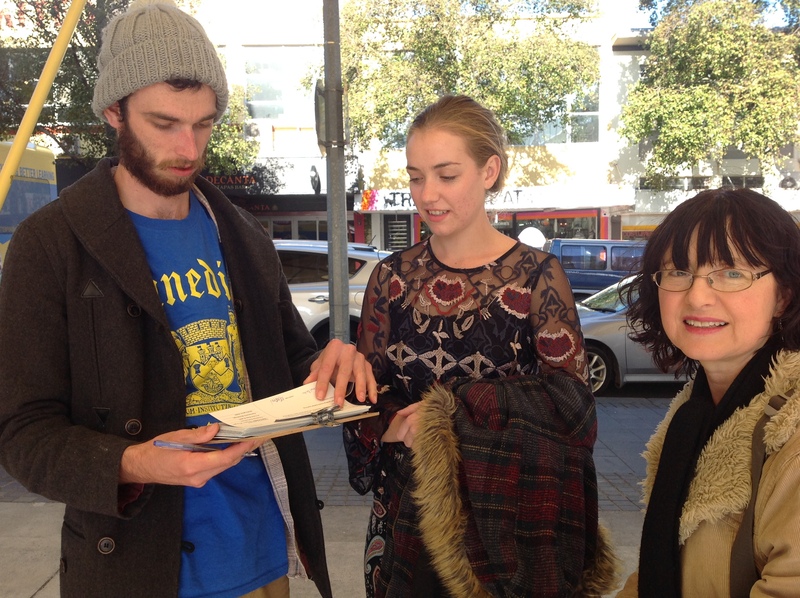 Below, Michael Barton and Sophie Hammond with NZEI’s Jenny Warnsbrough – Michael was only too pleased to sign. 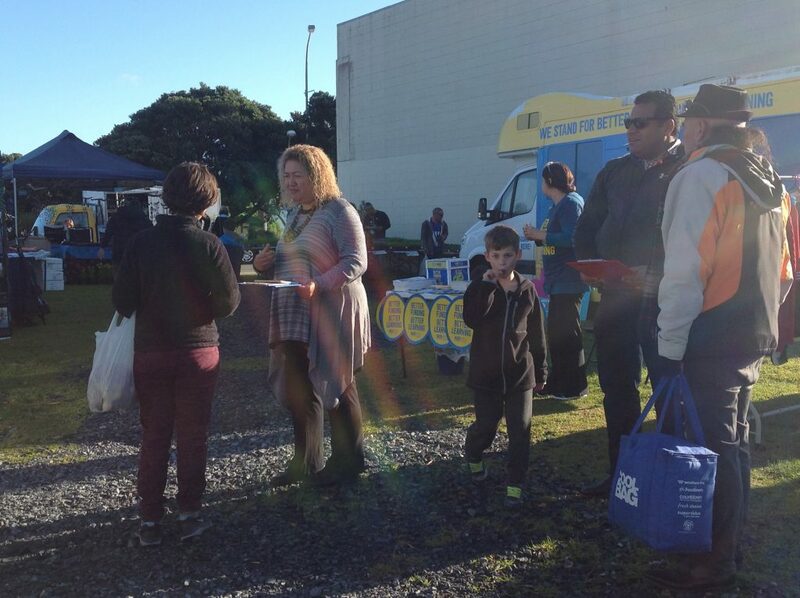 The campaign hits New Plymouth. Yesterday, at Brooklands Kindergarten in New Plymouth. 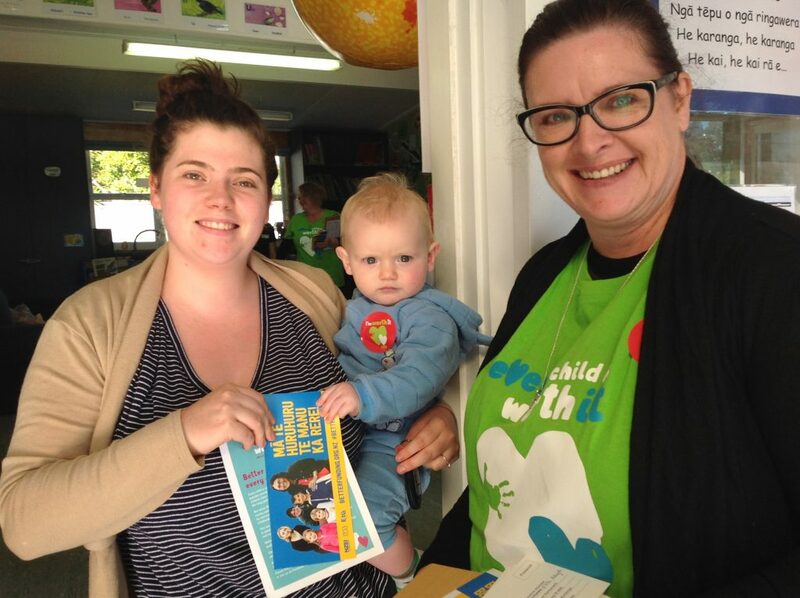 Dee Riddle, Head Teacher at Pukekura Kindergarten, pictured right, talks with parent Zoe Davies and baby Tobias Pretty about the funding cuts in Early Childhood and the impact on providing quality education in NZ. 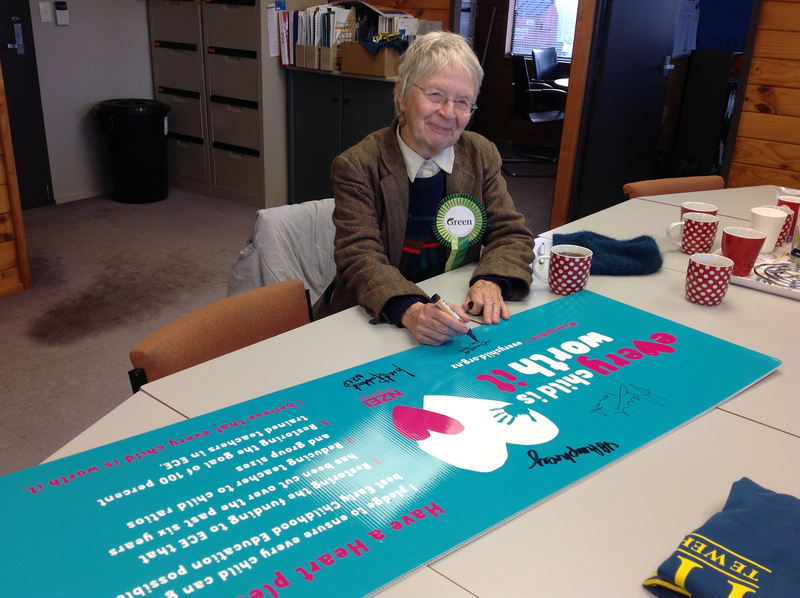 MANAWATU – APPROXIMATELY 900 CONVERSATIONS AND POSTCARDS SIGNED. GO MANAWATU!! 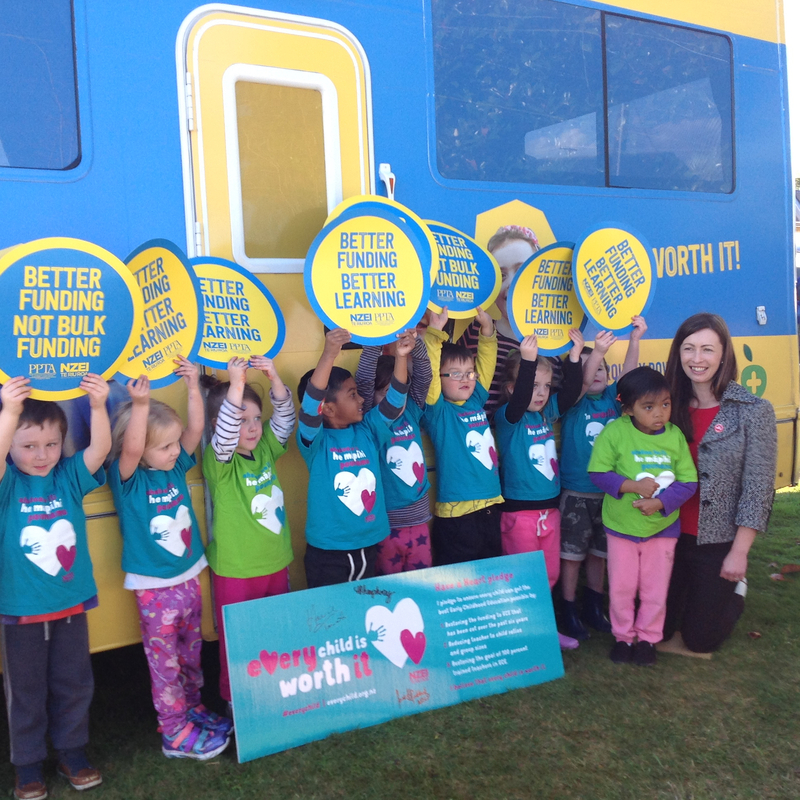 “Take care of future generations ” was the message loud and clear at Kelvin Grove Kindergarten in Palmerston North. 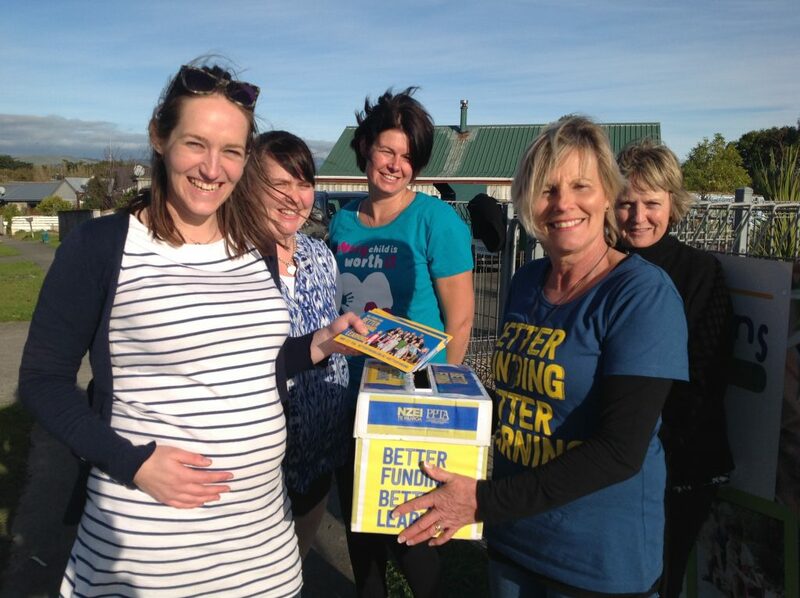 Leanne Walls (holding the box of signed postcards) with (from left) Sarah Aitken, Emma Anderson, Tammy Dodge, and Penny Burton. 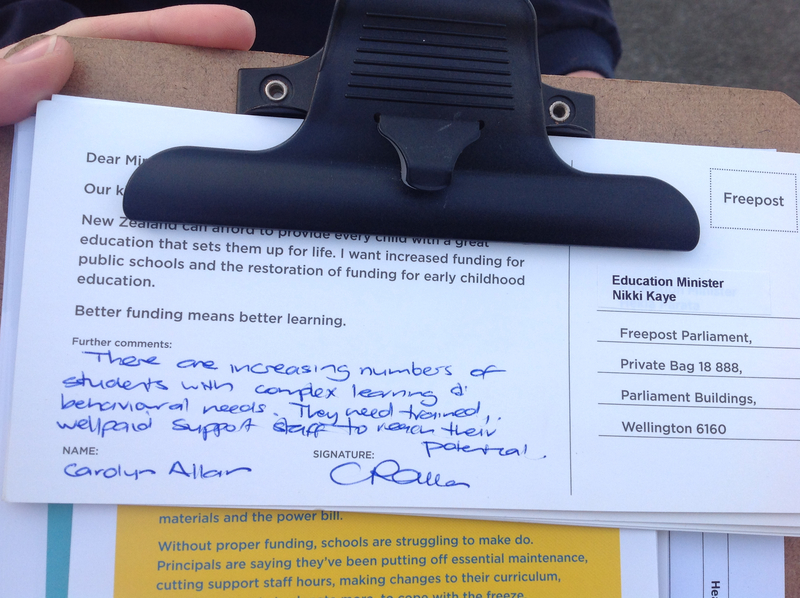 Feilding's 313 postcards to MPs. 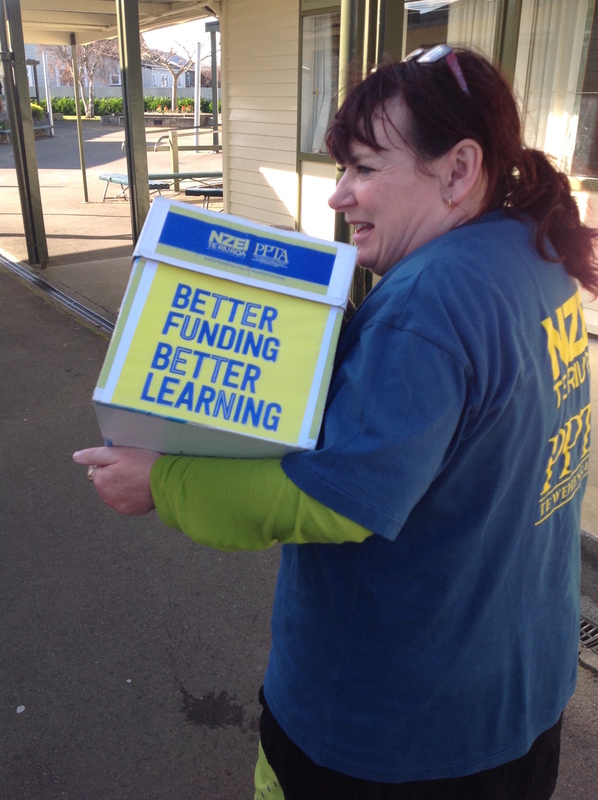 Field officer Cathy Keene carrying the 313 postcards to be posted to MPs from Feidling = 313 conversations in just Feilding = popular support rising towards the election! It’s not just that tide has turned, it’s a tidal wave of popular support for the better funding for education. 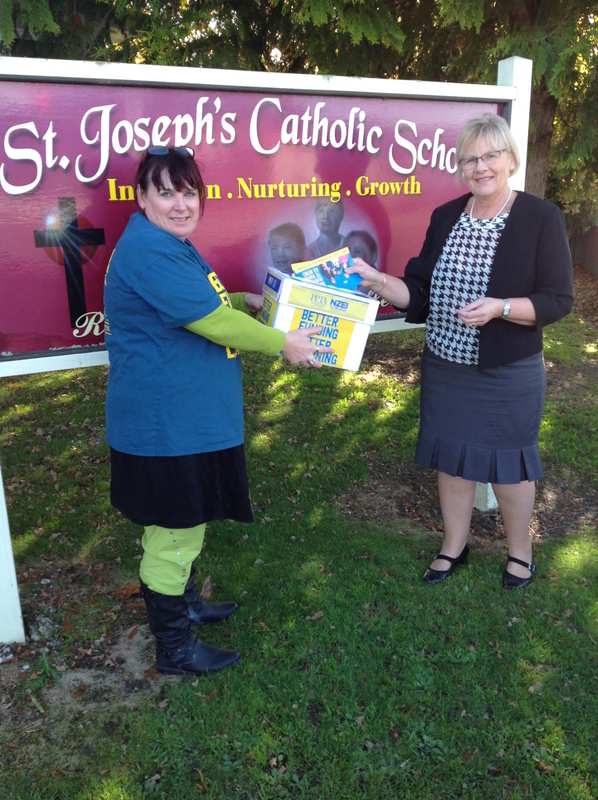 At St Joseph’s School in Feilding, Mary Howard the office administrator posting the school’s signed post cards.